The Quiet Man (1952) is one of the 1001 classic movies you should see. This romance set in Ireland stars Maureen O'Hara and John Wayne. Each week, I'm going to recommend a classic movie you should see (for the reasons behind the 1001 series and reviews of earlier films covered go here). Every August TCM airs its Summer Under the Stars film festival, which features 24 hours of movies from a different old Hollywood actor for 31 days. 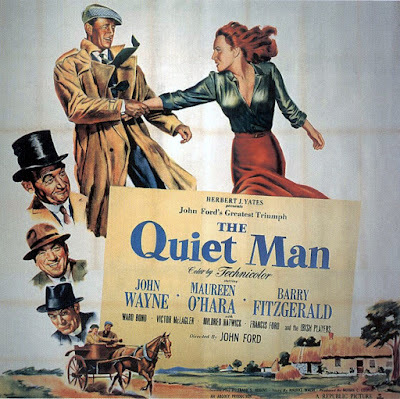 This month, I'll be covering one movie from each Saturday's honoree; Aug. 12 is John Wayne day, so I'm writing about the Emerald Isle romance The Quiet Man (1952), which is airing at 8 p.m. Other Wayne movies covered in this series are The Man Who Shot Liberty Valance (1962) airing at 5:45 p.m. and They Were Expendable (1945) airing at 3:15 a.m. The Quiet Man tells the story of Sean Thornton (Wayne) a former boxer from Pittsburgh who is trying to escape his troubled past by reclaiming his family's ancestral lands in the small Irish town of Innisfree. 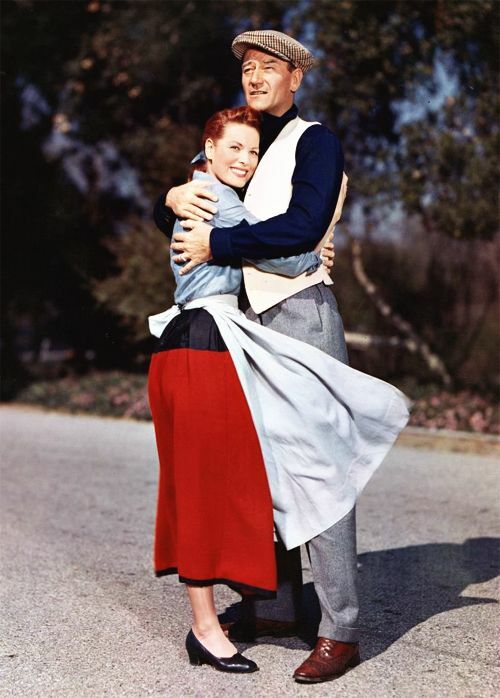 While settling in to his new home, Sean meets and falls in love with the beautiful and spirited Mary Kate Danaher (Maureen O'Hara) who is the sister of the powerful local squire (Victor McLaglen). Sean and Mary Kate eventually marry, but a dispute between Mary Kate and her brother over her dowry drives the newlywed couple apart. The Quiet Man was based on a 1933 short story by Maurice Walsh that appeared in The Saturday Evening Post. Director John Ford acquired the rights in 1936 for a mere $10, but he went through an almost two decades long struggle to get the film made. Finally, Wayne, a friend and frequent collaborator of Ford's, decided to do a favor for his mentor by persuading Republic Pictures founder Herbert Yates to finance a Technicolor movie that was filmed on location in County Mayo and County Galway. The movie was a solid hit that won Academy Awards for best director and best cinematography and, thanks to frequent cable showings, has become one of the most beloved and familiar old Hollywood films. The Quiet Man was something of a departure for Wayne, who was then one of the biggest movie stars on the planet. First, it was a romance in which the female lead was as important as Wayne's character, but, more importantly, it showed a vulnerable side to Wayne. As anyone's who's spent time watching Wayne's filmography knows, there was rarely ever a crack in his manly man screen persona. Wayne usually played the kind of personalities who could have major surgery without anesthesia just before leading troops into battle, but Sean Thornton is, as the title suggests, much more vulnerable. He's virtually the only Wayne character who ever expresses self-doubt or fear; at one point, Sean is called a "coward," which would be unthinkable in any other Wayne film. 1. Location shooting.The Quiet Man was filmed on location in and around the village of Cong in Northwest Ireland. Many of the locals appeared in the film, and they still capitalize on the movie's popularity with a The Quiet Man museum, a statue of O'Hara and Wayne, and showings of the film in the local pub (there's more here). 2. O'Hara. Although Wayne is the top-billed star in The Quiet Man, O'Hara is the central character in the film. Ford gives her the camera in a series of lovely closeups, and it is her story arc -- that of an independent woman who is trying to navigate her way through a traditional society -- that drives the movie's plot. 3. Supporting actors. Ford drew from his unofficial stock company of actors and from Dublin's famed Abbey Theatre to cast the roles of the colorful villagers. Watch for Barry Fitzgerald as a tipsy cab driver/matchmaker, Mildred Natwick as the feisty "Widow" Tillane, and (my personal favorite) Ward Bond as a no-nonsense parish priest. 4. Music. Victor Young's lovely score is filled with traditional Irish music most notably the lovely ballad "The Isle of Innisfree." Ford also uses folk songs to underscore the action such as when Sean enters a pub to the strains of "The Wild Colonial Boy" and when Mary Kate's regrets about her new marriage surface during a rousing rendition of the rollicking tune, "The Humour Is on Me Now." 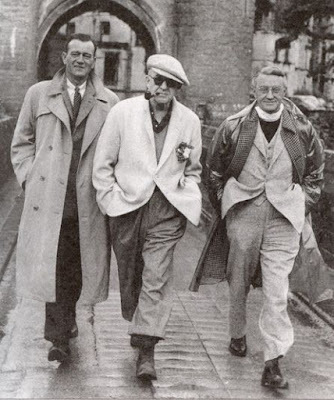 John Wayne, director John Ford, and Arthur Shields filming The Quiet Man (1952) in Cong, Ireland. Other critics: The Quiet Man has a 90 percent fresh rating on Rotten Tomatoes and Leonard Maltin calls it a "boisterous blarney, with beautiful Technicolor scenery, and equally beautiful music" in a 4 star review for his Classic Movie Guide. Critics in 1952 mostly regarded the film as a pile of sentimental mush that was nevertheless well-acted and well-photographed. The New York Times reviewer praised the cast and the music before dragging out every Irish cliche known to man for a lengthy but positive review of "as darlin' a picture as we've seen this year." The Variety reviewer mostly dismissed the film as a robust romance, but he or she did praise Wayne's "vigorous, physical" performance and Fitzgerald's turn as a "socko punching of an Irish type." The Bottom Line: There's no doubt that The Quiet Man is bathed in Ford's particular brand of Irish sentiment, but it's still quite an effective and moving film. Watch it for the great performances all around, the beautiful scenery, and the haunting score. Availability: The Quiet Man will air at 8 p.m. Aug. 12 on TCM. Also available on DVD, Blu-ray, and video on demand. Next week, I'll continue the August theme of Summer Under the Stars with Aug. 19 actor Angela Lansbury in The Manchurian Candidate (1962). My no. 1 Desert Island movie. If I'm stuck somewhere, I want the folks of Innisfree to be with me.